Illumination that goes with everything, complements any design scheme and is the most versatile option for every lighting project. We're talking about white Christmas lights, of course! No job is too big, small, simple or unique for white lights. 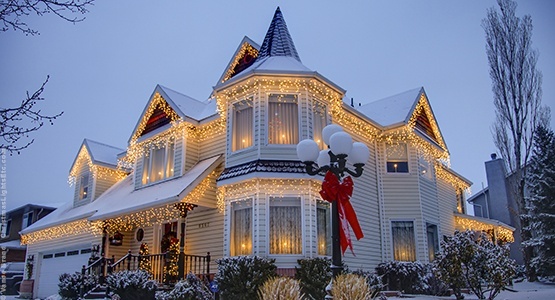 Choosing the shade of white to use in your Christmas light display ultimately comes down to personal preference, however understanding the differences in color tones and where they look best can help make the decision easier. Warm white LED and clear incandescent Christmas lights produce a cozy glow with a slightly golden tone that works well inside and outside, whereas cool white LEDs emit bright, vivid white light which is most often used in exterior Christmas displays and can be seen from greater distances in outdoor settings. Whether you're decorating your home inside or out, for Christmas or year round illumination, white lights are truly the most versatile and popular of Christmas light colors. There is nothing more timelessly classic than a string of white C7 or C9 Christmas light bulbs dotting the roof or white icicle lights lining the porch during the holiday season. White is also one of the most popular pathway lights colors for creating gorgeously outlined landscapes and illuminated walkways for guests during events and holiday gatherings. White Christmas lights look beautiful on their own, especially when accenting holiday greenery and indoor Christmas decorations, however creating color combinations with white lights is a fun way to liven up Christmas displays. Popular Christmas light combinations include red and white candy cane themed lights, red, green and white classic Christmas lights, and blue and white lights for a winter wonderland display. Classic and elegant, white lights are perfect for weddings! White mini lights, icicle lights and globe lights are among the most popular light styles used for illuminating ceremony and reception spaces. White Christmas lights on green wire are perfect for use in natural settings at outdoor weddings and white wire string lights blend flawlessly next to sheer fabrics and delicate accents. Try a few of the wedding decorating ideas using white Christmas lights below, and be sure to visit our wedding lights page for more beautiful ways to brighten your big day!